Sometimes I wonder, are there still good people in this world? Well last night, my question was answered. First off, I had a “girl’s night” dinner at The Cheesecake Factory. It was a much needed girl time that we BOTH needed. I’d left straight from work, made a stop at the gas station, and headed straight to the restaurant. We had a great time catching up on…life! Then I decided to call the restaurant just to make sure it wasn’t in the booth or something. I was greeted by a nice woman and she put me on hold for 10 minutes to go look for my card. The manager then picked up the phone and asked me what my name was. I told him and then he burst out laughing. Umm k, kind of starting to freak out here, what’s up? So, an awesome, random customer saw my card in the bottom of a public toilet, reached her hand into the nursty water to save my precious debit card! I mean, had she left it there and just decided to flush it to toilet heaven I would’ve completely understood. I asked the manager if the customer left her name so at least I could thank her, but she didn’t. So there are still people out there who will sacrifice their hand to a public toilet to retrieve and turn in your card! Here is the salad I prepared for us to eat for lunch. To follow the fodmaps diet, I mixed everything together minus the goat cheese. Then prepared a bowl for my sister and then added the cheese. She thought the salad was still awesome and refreshing without the cheese. Ok, this is one of my favorite salads! 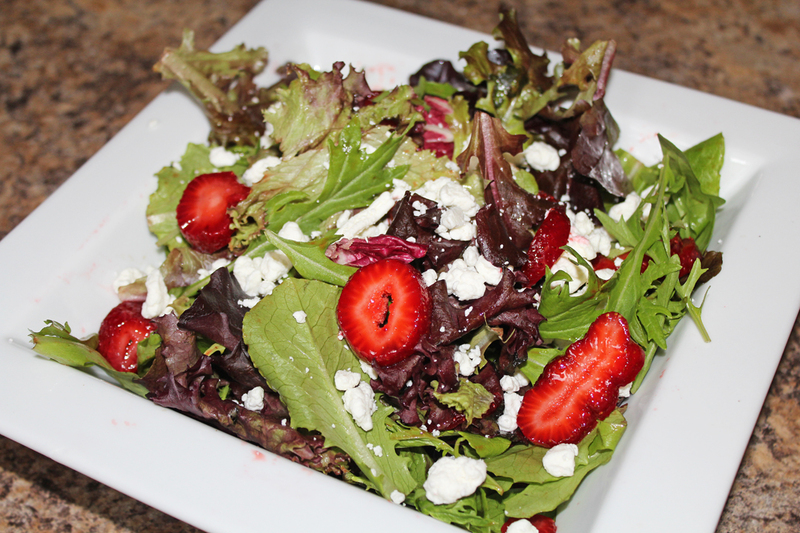 This salad is super healthy and combining the strawberries, lemon juice, and goat cheese creates its own dressing. Actually, most salads I use a fresh squeeze of lemon juice instead of dressing because it really cuts down on the calories. And it didn’t hurt that the strawberries were from the farmers market! Put all of the ingredients in a bowl and toss. Done. Mmm this salad looks incredible, one of my favorites!! Looks nice and healthy and I think I see arugula in there. Delish! Oh yes. A lovely spring mix! The herb mix is also nice. HAHA! Was it you? I probably would've gone to get someone to get it out. If it were my toilet at home, yea I'd reach my hand in there, but the public bathroom is what gets me lol. So glad for people like you!! Follow back from MBC. Can't wait to try some of your recipes. This looks lovely. Will have to try it out, and will be definitly trying out dome of your other recipes as well! New follower, from the blog hop. this looks fantastic! i love love love feta!Found you through Mom Blogging Club. Followed by Google Friend Connect. From the share it friday blog hop! This salad looks SO cute! Ha! What a funny story! Would you have reached into the toilet for a stranger's card?! I might've flushed and walked! I really like goat cheese and strawberries on salad. Thanks so much for linking this to Must Try Monday. If it were my home toilet yes, public probably not. I'm wondering how many times it got flushed before someone picked it up! It's crazy how “heavy” salad dressings can make a salad. The lemon is so much lights and healthier. Awesome! Let me know what else you try, I love getting feedback.